Tropical Depression 14E formed far from land and poses no threat to land areas. On Aug. 14, NASA-NOAA's Suomi NPP satellite flew over developing Tropical Depression 14E in the Eastern Pacific Ocean. The Visible Infrared Imaging Radiometer Suite (VIIRS) instrument aboard NASA-NOAA's Suomi NPP satellite captured a visible image of 14E that showed bands of thunderstorms wrapping into the center from the north. 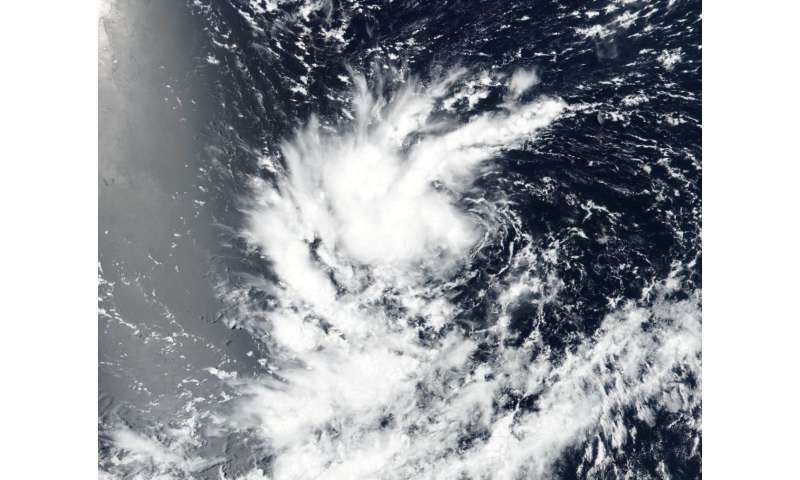 On Aug. 15 at 5 a.m. EDT (0900 UTC), the National Hurricane Center (NHC) reported the center of Tropical Depression Fourteen-E was located near latitude 10.8 degrees North and longitude 122.3 degrees west. That's about 1,170 miles (1,880 km) southwest of the southern tip of Baja California, Mexico. The depression is moving toward the west near 14 mph (22 kph), and this general motion over the open Pacific Ocean is expected to continue for the next couple of days. A turn to the west-northwest is forecast to occur on Friday. Maximum sustained winds remain near 35 mph (55 kph) with higher gusts. Gradual strengthening is forecast during the next three days, and the depression is expected to become a tropical storm later today and a hurricane by late Thursday or Friday.